This Glacial Milk Water was collected by hand by myself. Just when I was collecting the water I felt amazing. Afterwards I noticed that my ears were glowing red like the do when I take Ormus and I'm really feeling the whirlies. Drinking this water has got to be the best water I've tried thus far. There really is something Special to this water that is fresh from the Glacier. I also took this special water and made and Ormus concentrate out of it. Or course it had a nice yield too indicating it’s full of goodies. 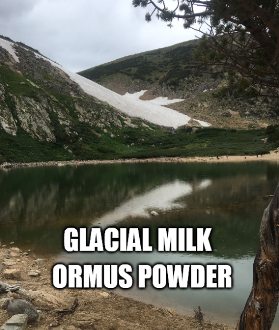 I also dried some Ormus concentrate out to make a Glacial Milk Ormus Powder. Did you know…that a scientist has been able to recreate Hunza water (also called “glacial milk”), which is a major factor contributing to the longevity of the Hunza people? The Fountain of Youth is not mere myth. The secret to longevity runs plentiful, high in the Karkorum Mountains, just north of Pakistan. The Hunza Valley is a land shrouded in intrigue–it is said that the book, Shangri La, is based on this mountainous, remote valley. What makes this land of particular interest is not its striking panorama, but the longevity of its inhabitants. The Hunza people have the longest average life span of any other population on earth, living disease-free, vital lives well past 120 years. There have been many theories posited as to why the Hunza live such long lives. Is it the vigorous daily exercise that comes from navigating mountainous terrain, or the diet of raw fruits and vegetables consumed? While these factors undoubtedly contribute, over 60 years of research has shown that the key factor to the Hunza’s healthy life span is the water they drink, water that is dramatically different from the water we ingest every day. Let’s start at the peak of the tale, when, at the age of 78, Nobel Prize winner and father of fluid dynamics, Dr. Henri Coanda handed over 60 years of research to 17-year-old science prodigy, Patrick Flanagan. Eleven-year-old Flanagan captured the attention of the Pentagon when he invented a device capable of identifying a missile launch from any location in the world. He was recruited by the government to work with the most influential scientists during the cold war, after being featured in Life magazine as 1 of the 10 most promising scientists in America; it was in these “think tanks” that Patrick met his mentor, Dr. Coanda. Expanding on Dr. Coanda’s research, Dr. Flanagan studied 5 isolated locations where people live healthy lives well past 120 years. The only common denominator among these communities is the composition of the water they drink, all of which comes from melted glaciers (hence the name, “glacial milk”). This water, which has also been dubbed glacial milk, has a lower surface tension and is more similar in composition to the water surrounding our cells than our drinking water is. Dr. Flanagan’s work has set the stage for further investigation of this very real Fountain of Youth. It is quite possible that the entire world can improve quality of life and add many more years with glacial waters’ remarkable, life-extending properties. The hike up to St. Mary’s Glacier ascends through a beautiful forest and ends with stunning panoramic views–the kind you expect from a perfect short hike in Colorado. If you walk around St. Mary’s lake then hike up the glacier, you will gain incredible views of the Rocky Mountains to the west. It is a quick hike–1.5 miles round-trip if you climb to the top, but only about 1 mile round trip if you only hike the lake and back. The St. Mary’s Glacier trailhead is about an hour from Denver and a great way to beat the summer heat, as there’s snow above the lake year-round.